The year is 1820. 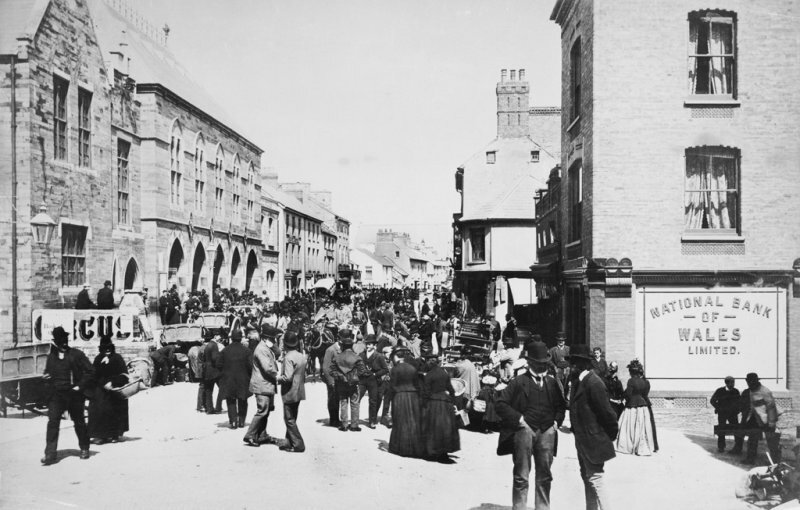 The town is a hive of activity on market day. Everything is sold on the streets in the open air. Meat for sale hangs from hooks attached to the outside of buildings, calves are being slaughtered as required, entrails discarded where they are removed, milk is being slopped into jugs and buckets. All this produce is being offered for public consumption while open to the elements, animals and insects, alongside ironmongery and everything else that is available from market stalls. And all among the rotting remains of last weeks’ trading. The town was growing and needed cleaning up. 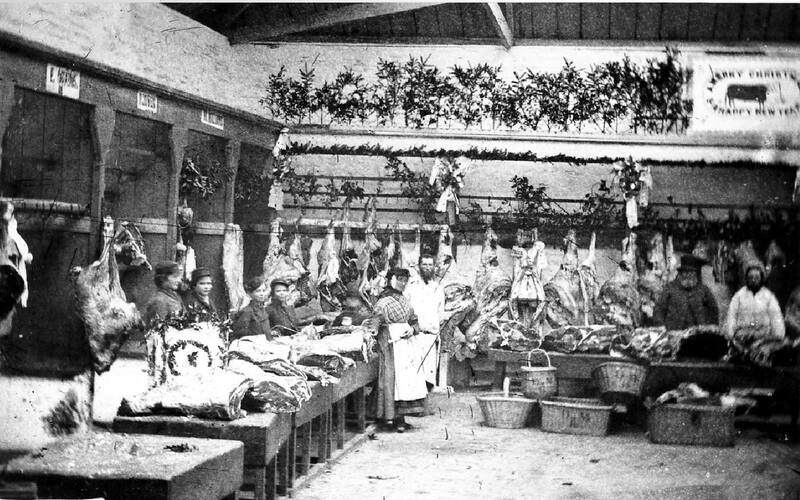 In 1822, a prosperous baker and publican William Phillips built a market hall and slaughterhouse at the bottom of Market Lane in Mwldan. He leased this to the Corporation for 99 years at an annual rent of £20. 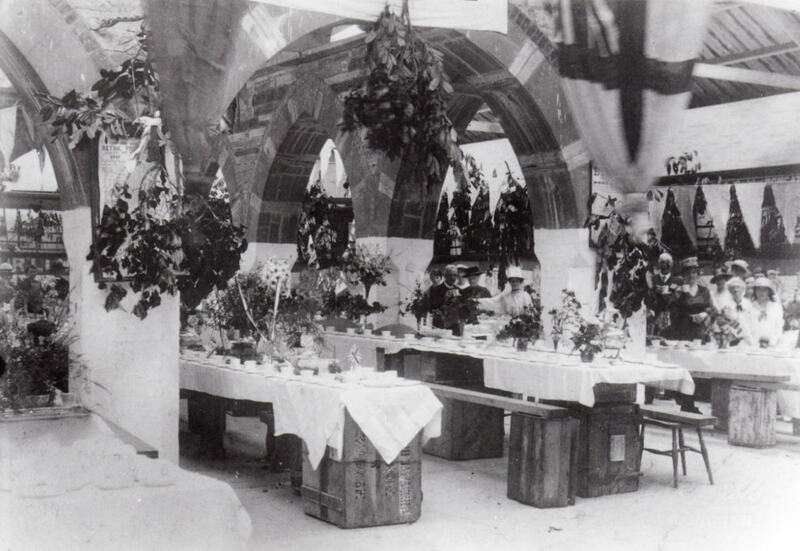 Soon, though, these premises were too small and the market spilled out onto the streets again. 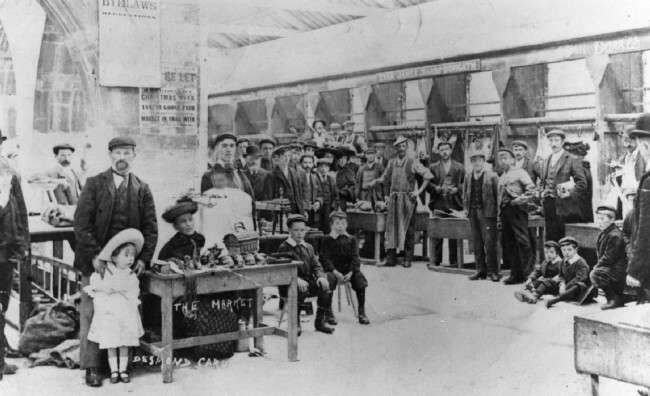 The Town Council decided in 1836 to pass by-laws that would tidy up the town and keep the market clean. There would be fines for those who did not comply. The town continued to grow as a market centre and was reported to be ‘greatly inconvenienced’ by the lack of an adequate market building. Something clearly had to be done. In 1855 the Town Council sought advice from a firm of London solicitors and were told that all necessary improvements could be embodied in one Act of Parliament for the sum of just £600. There were objections, of course, as the new scheme would mean closing the present market but the owners of the building were paid £100 each as compensation and work could begin on the new market building. 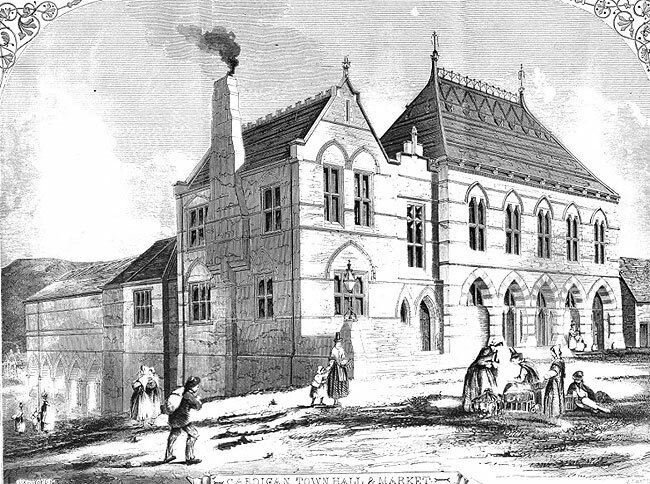 The site chosen for the new Market Hall was the Free School Bank – the slope just beyond the site of the medieval North Gate and a prominent location at the head of Priory Street, then being cut through. The grammar school, which had occupied the site since 1804, would be rehoused in the new building. The slaughterhouse was to be built well away from this on the site of the poor houses near Bath House in Upper Mwldan. By November 1856 the plans were approved and in July 1857 the necessary Act of Parliament was obtained at a cost of £943. The plan shows the market to have had meat on the North side and poultry, butter and cheese on the South side of the upper floor. On the lower floor, animals were sold live and then taken to the new Slaugherhouse (built under the same contract) in the valley a couple of hundred yards to the North (now Theatr Mwldan). This was the first civic building in Britain in the ‘modern Gothic’ style advocated by John Ruskin and included an Arabic influence, which can be seen clearly in the arch decoration in the Guildhall and Market Hall. The national interest in the design was reflected at the time by an illustration in The Building News of 1859 and is still noted as an exceptional rarity in the context of Gothic public buildings by experts in Victorian architecture. The two levels of the market are quite different spaces. The lower market displays a medieval character of rounded piers and arched vaults lit by a light well from the upper level and windows on the S and W walls. The open central light well is bounded by Gothic arches, two on the E and W, and three on the N and S, and is surrounded by an outer ring of round columns. The columns have a sturdy simplicity, tapered round base, round shafts broached at the top to square. The Gothic arches of the light well mirror those of the outside with Box stone alternated with the grey, and a red brick outer course. The central stairs to the upper level were inserted in 1969 with the removal of the original central boarded floor. In the SE corner is the fine stone staircase to the upper floor with massive but delicately curved stone rail. With nine large windows and the light-well, the lower market is not badly lit, though darker along the windowless E and N walls. The floors are slate flagged apart from in the light-well area, where there is modern concrete. The upper market is a much lighter space, lit from glazed ridges of the four surrounding roofs and a glazed lantern on the hipped roof over the Gothic light well. The windowless outer walls were once divided into bays by partitions probably of timber with a kind of pelmet across each bay with the name of the trader. The floor is paved with large slate slabs. 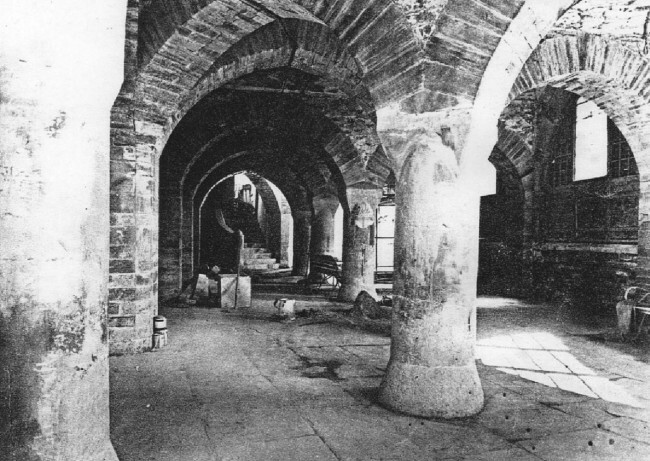 A middle eastern influence is shown in the banded archways around the light well and the building exterior. 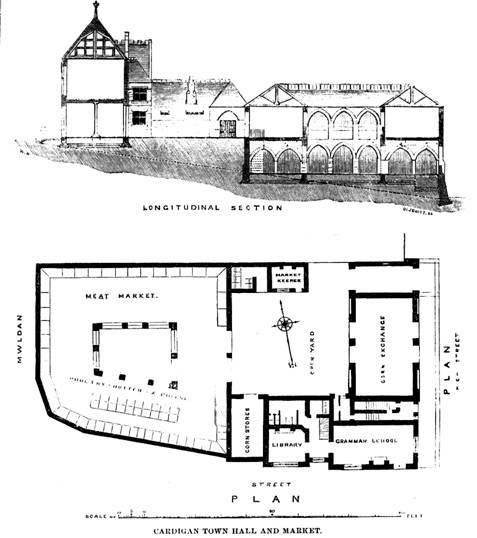 The upper market leads into the courtyard and main street level, with the twin windows shown as open entrance archways in the original plans. 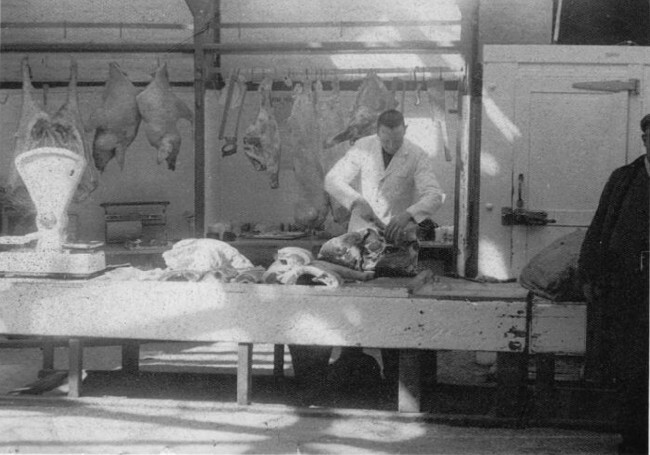 The building has been in continuous operation as a market since its opening in 1860, despite various discredited attempts in the past to alter the building and its use. The principal walling material used is blue Ordovician slate from the quarries at Cilgerran, with thin horizontal bands of red brick.